Dave Dunteman, also known by his Air Force call sign “Dunto,” is living his childhood dream. Growing up in Cincinnati Ohio, he watched as B-58 Hustlers flew overhead and yearned to join the great fraternity of the sky. In 1980, he was afforded the first step in fulfilling that dream as he was offered an appointment to the Class of 1984 at the US Air Force Academy. Dave graduated with a Bachelor of Science, but was proudest to have spent many afternoons and weekends at the Academy airfield teaching cadets to solo in the Academy’s “Soar for All” program in the Schweizer 2-33 sailplane as a Certified Flight Instructor—Glider(CFIG). Next, Dave attended Undergraduate Pilot Training (UPT) at Williams Air Force Base, flying the T-37 and T-38. After training, Dave was awarded a position flying the A-10 and, after nine months of training, departed for Suwon Air Base in Korea for his first real job as an Attack pilot. Dave learned quickly and was upgraded to flight lead in his first annual assignment. After serving as an Attack pilot in the Pacific theater, Dave’s next assignment took him to the United Kingdom where he spent two and a half years learning the European theater and the challenging weather conditions in England and Germany. Next, Dave came back to the US as an A-10 flight instructor in Tucson Arizona. He spent six months in Las Vegas attending the Fighter Weapons Instructor Course and was awarded the Outstanding Flying Award. As this assignment came to an end, Dave was competitively selected as a Royal Air Force Exchange pilot and trained in the BAE Hawk and the Gazelle helicopter in preparation for his role as a Harrier GR7 Pilot. After one year of training in the UK, Dave joined his operational RAF squadron at RAF Laarbruch in Germany for two years. Dave subsequently attended Air Command and Staff College in Alabama and then returned to the cockpit in the F-16CJ at Mountain Home Idaho, changing roles from the familiar Close Air Support to Suppression of Enemy Air Defense. After three years there, he moved to his last assignment in Phoenix Arizona teaching in various roles again flying the F-16C. Dave retired as a Lieutenant Colonel in 2004 and was hired by a major domestic airline where he currently flies as a 737 Captain. Dave has always remained highly active in general aviation: He continued flying gliders while in Germany with the RAF, in Tucson he began flying at the Aero Club in the T-34 and also added a tailwheel endorsement in a Super Cub, he began flying a Pawnee in Idaho and then once in Arizona flew Pawnee tow planes and gave commercial glider rides in his free time. While stationed at Luke Air Force Base, Dave became acquainted with Fighter Combat International and began flying the Extra 300L in 2002 and has been with Aviation Performance Solutions since that time. During that same time he joined the Tucson Soaring Club and has served there as safety officer and chief instructor. He has also served as a Designated Pilot Examiner for the Scottsdale FSDO providing glider examinations. Lastly, Dave has enjoyed several roles as aircraft owner. He has owned a Pitts S2B, an LS-8 sailplane, an Aviat Husky, and currently owns a CubCrafters Top Cub. Dave is active in a number of industry safety and educational efforts. He has been asked to participate in the RAF’s annual meeting for the last three years and has presented on safety and risk analysis in the back country flying environment. 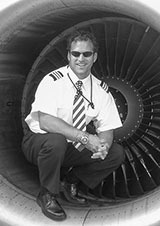 He has taught academics to the GAMA BOD and flown with them in the back country in Montana and Idaho, and he currently travels the US with a group of flight instructors teaching Short Take Off and Landing seminars which focus on expanding pilots’ knowledge on the topics of Aeronautical Decision Making and mission planning. Dave has over 15,000 hours of flight time and considers it his honor to have the opportunity to provide dedicated, focused Upset Prevention and Recovery Training (UPRT) to the clients of Aviation Performance Solutions. Dave and his wife Nora, as well as their extended families, call Phoenix home. They have three adult children and enjoy their time as avid travelers, and they enjoy hiking, skiing, and biking in our beautiful state.